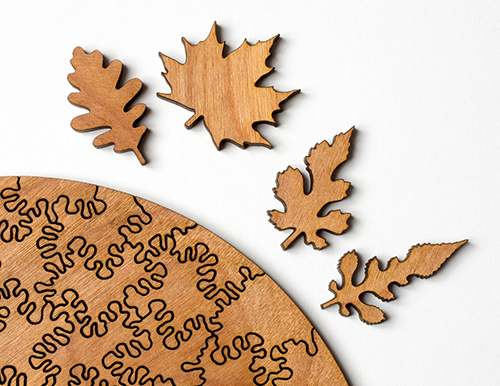 Our unique process combines art, science and technology to produce state of the art puzzles lasercut from wood. Every puzzle features a one-of-a-kind pattern of pieces that is computer generated. Our unique shapes are based on how patterns form in nature. They "grow" to fill your puzzle allowing us to make puzzles with any shape! 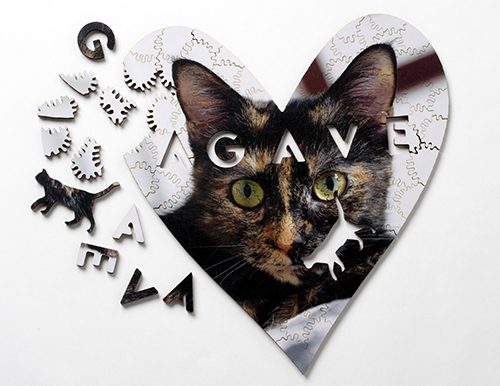 Personalize your puzzle with special pieces shaped like letters, numbers and figures. We can also engrave the back of your puzzle with a custom message. 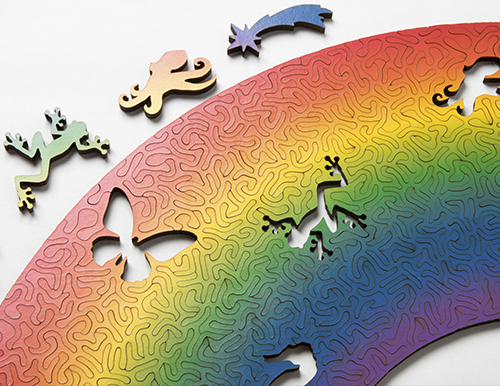 Each generative puzzle is a one-of-a-kind creation with unique art and pieces. Our goal was to fuse the artistry of traditional, hand-crafted jigsaw puzzles with the possibilities of new technologies. Custom software simulates crystal growth to create an organic interlocking pattern. 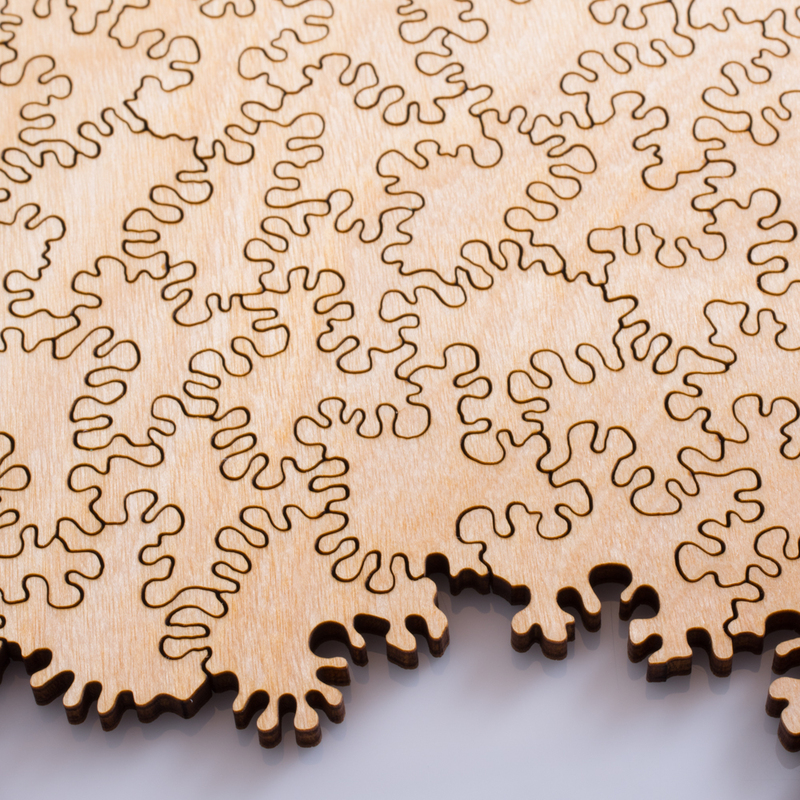 Our laser cutter translates this into a unique set of plywood pieces. By uploading, you affirm that you possess all rights and permissions required to use the image. How big do you want your puzzle to be? We can make them as small as 5 inches and as big as 18.
warning Your image resolution is less than 100dpi. We recommend either using a higher resolution image or a making smaller puzzle. what type of puzzle pieces would you like? 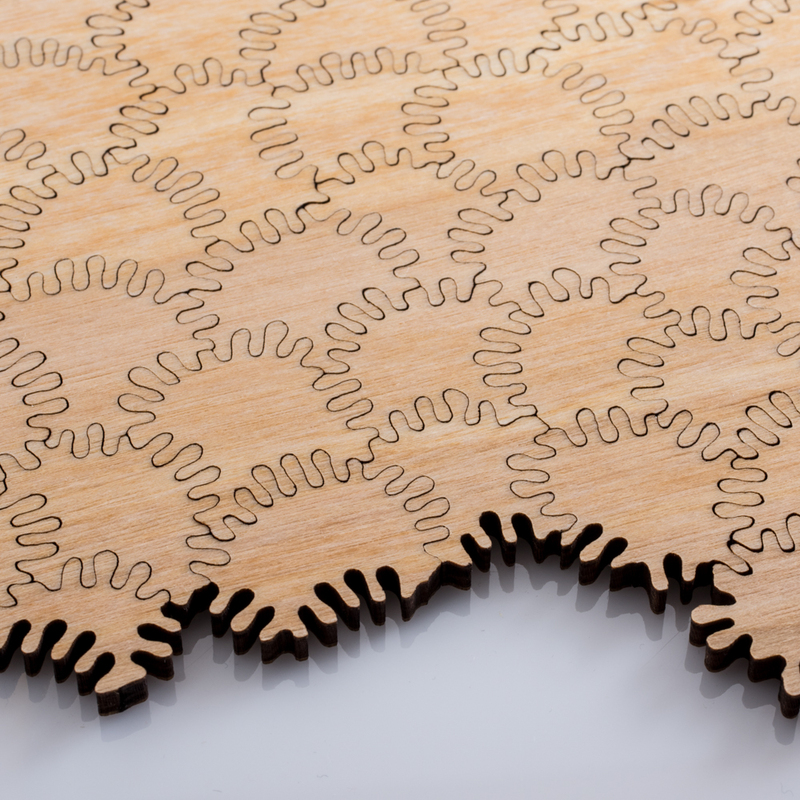 Our "amoeba" jigsaw cut style is an extra challenging variation on our dendrite system. Small cilia-esque protrusions create a repetitive pattern with higher piece density. Our original cut based on a simulation of dendritic solidification, a type of crystal growth that occurs in super cooled fluids. Amorphous brach-like forms grow to interlock the pieces using a computational technique called phase field modeling. 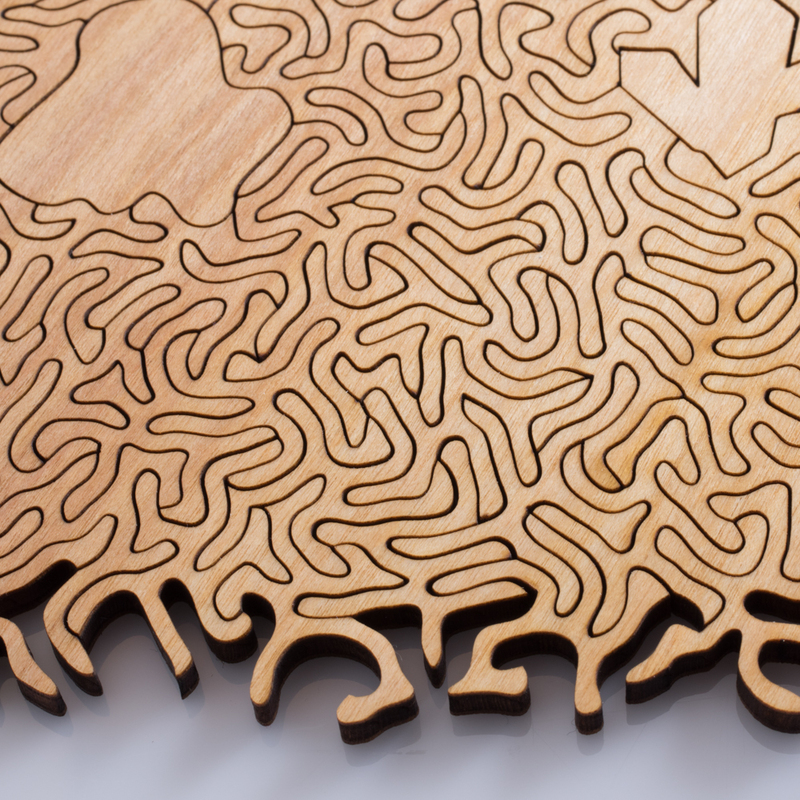 A dense, maze-like cut pattern. The extreme intertwining and high piece count makes Maze our hardest cut style. The pieces are grown in a simulation of elastic rods. The edges grow, lengthening, until they collide, pushing each other into contorted shapes. 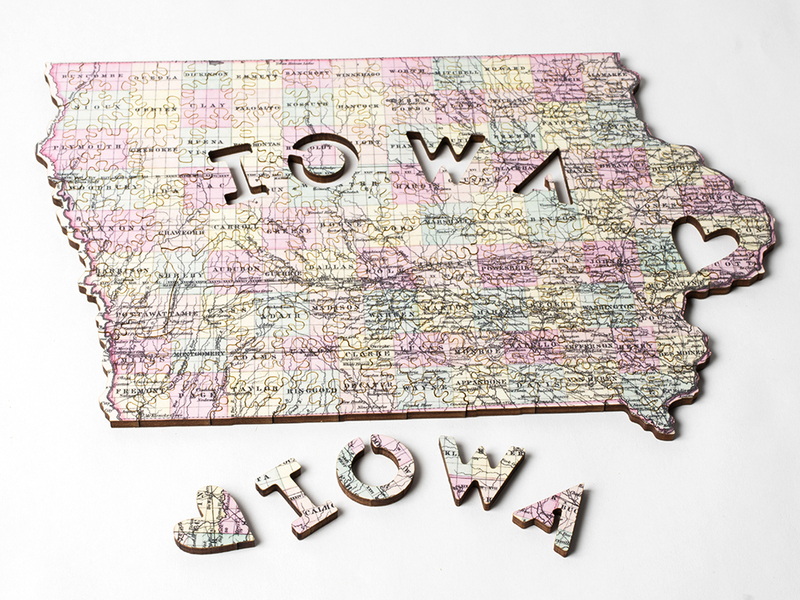 Whimsies are special pieces shaped like recognizable figures that are interspersed throughout a jigsaw puzzle. Your inch puzzle can fit whimsies. In this step, you can select your whimsies and position them within the puzzle. You are almost done! If you would like to title your puzzle or engrave a special message on the back you can do so below. Tired of rectangular puzzles? With this feature you can make your puzzle any shape you want! Simply upload a black and white image defining your shape. We are saving your puzzle. 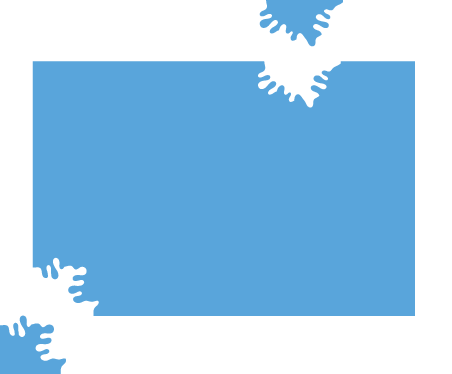 This may take a moment for puzzles that use high resolution images. Unable to fit whimsy in your puzzle. Try rearranging your whimsies to make more space.